Dell's latest is sturdy, ergonomically sound and has good business features, but rivals are slicker, lighter, faster and longer-lasting, with better screens – and they don't cost much more, either. Dell's latest portable is a business machine designed for productivity and mobile power – it's got one of Intel's latest Broadwell processors inside a chassis that's light and slim enough to sling into a bag. That's not the end to this machine's versatility, either. Numerous specifications are available, the internals can be accessed, and it's littered with ports and sockets. This is a pure business machine, so it won't win many style points. The lid is coated with dark, matte metal with a lighter hinge made of anodised aluminium, and the interior is finished with the same material around the screen and sunken keyboard. It doesn't turn heads, but build quality is beyond reproach – the wrist-rest doesn't flex, the screen barely moves, and the base is strong. 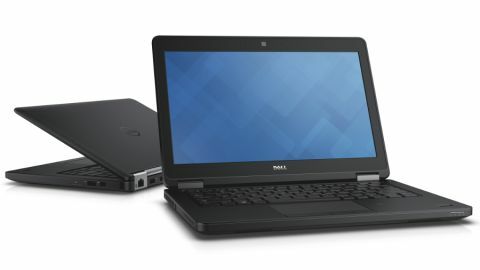 That's all good news for a business machine, but the lack of design nous does mean the Dell isn't as svelte as rivals, with a weight of 3.4 pounds (1.56kg) inside a 0.9-inch (23mm) body. The Lenovo ThinkPad Yoga 12 weighs 3.3 pounds (1.5kg) and is 0.7-inches (18mm) thin, and the Dell XPS 13 looks better, weighs just 2.57 pounds (1.17kg), and is only 0.59-inches (15mm) from top to bottom. At least the Latitude isn't short on features. The top surface has a fingerprint reader and a row of handy status lights, and the back edge houses two USB 3.0 ports, an HDMI output and a Gigabit Ethernet socket. That's not the end of the port selection – the left-hand edge hosts a headphone output and SmartCard reader, and the right-hand side serves up an SDXC card slot, another USB port and a mini DisplayPort output. We have no major issues with this machine's ergonomics. The backlit, spill-proof keyboard is sunken to afford each button more travel, and they're all excellent – comfortable and consistent, with an action that settles at a nice point between soft and firm. The single-height Return key is a niggle, but that's our only qualm with this keyboard, which has more than enough quality for serious typing. The trackpad is just as good – wide, and with a pair of sensible, snappy discrete buttons. That's not the end to the Dell's versatility. We've reviewed the cheapest Latitude 12 5000 specification, which can be had for £600 (around $930, or AU$1,165). Spend £662 (around $1,030, or AU$1,290) and you'll get a machine with a Core i5-5300U processor but the same components elsewhere, and fork out £895 (around $1,390, or AU$1,740) and you'll double the memory and replace the 500GB hard disk with a 256GB SSD. Larger batteries and touchscreens are available, too, but they also cost more. The specifications can be customised with a variety of extras. Data protection can be added for one, three or five years, and a number of docking stations will give you a variety of additional ports. BIOS updates can be installed remotely, and the Dell Client Command Suite can make it easier to manage a large deployment of machines. The Latitude's specification is sensible rather than barnstorming. The Core i3-5010U is a dual-core, low-power part from Intel's latest Broadwell range, which means it's designed to balance performance with efficiency. It's paired with 4GB of memory and a 500GB hard disk – standard for this kind of system. Connectivity is covered by dual-band 802.11ac wireless and a mobile broadband card, and there's Gigabit Ethernet. TPM 1.2 and NFC are both installed. The base panel is tricky to remove, but the internals are accessible. The networking chips can both be removed, the memory stick and hard disk are easy to swap, and a second memory slot can be used to double the machine's RAM. The 38Wh battery can also be accessed. Little impresses about the screen – it's matte, so it won't be disturbed by bright office lights, but its 1,366 x 768 resolution puts paid to serious work, making it tricky to open large applications or have two windows open side-by-side.